America's 3,300 licensed, independent beer distributors and their 130,000 employees are citizens in the communities in which their businesses operate. They understand that alcohol is not like other consumer goods and can have consequences if abused or consumed illegally by those underage. That is why beer distributors take steps to ensure the safe and legal sale of alcohol and fight efforts to weaken regulations that exist to provide a safe and orderly marketplace. They participate in a wide variety of programs to promote responsible consumption and to eliminate drunk driving, alcohol abuse and the underage purchase and consumption of alcohol. Programs range from providing free taxi rides home for bar or restaurant patrons to sponsoring alcohol-free after-prom events and producing educational materials to help parents talk to their children about underage drinking. Distributors also promote alcohol education initiatives, such as inviting guest speakers to schools and community centers to share their personal experiences involving alcohol. 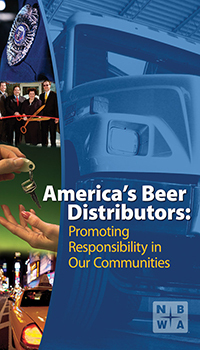 The brochure America's Beer Distributors: Promoting Responsibility in Our Communities provides education on the numerous programs beer distributors provide to promote safety and reduce alcohol abuse. NBWA creates public service announcements (PSAs) to address alcohol abuse, including illegal underage drinking and drunk driving. Print PSAs can be customized for placement in newspapers, programs, brochures and other materials. The PSAs also make excellent posters to display at schools, community centers or in businesses to reinforce the dangers and consequences of underage drinking and drunk driving. NBWA also produces audio PSAs for distribution to radio stations. NBWA also encourages its members, along with parents and community leaders, to utilize resources provided by the U.S. Health and Human Services Substance Abuse and Mental Health Services Administration (SAMHSA). The website www.stopalcoholabuse.gov includes resources that can assist in educating young people about the dangers of underage drinking and the importance of making healthy choices. The National Beer Wholesalers Association and its members are committed to ensuring that the licensed beverages they provide are enjoyed legally, responsibly and safely while remaining consistent with respective state and federal laws. NBWA’s promotional and marketing efforts are designed with these aims in mind. Responsible marketing can be an effective means of encouraging appropriate consumption of licensed beverages and informing consumers of the tremendous selection of beverage products available to them. NBWA also recognizes the important role communications can play in discouraging irresponsible consumption of alcohol, including illegal underage purchase and consumption, excessive drinking and drunk driving. While the laws that govern the licensing and practices of beer distributors are paramount, NBWA's Marketing & Communications Code is intended to provide additional guidance on beer distributor marketing and related promotional activities. The code sets forth voluntary principles of responsible marketing, which NBWA believes all of its members should honor. Distributors across the country are conserving resources in warehouses, on the roads and in the marketplace. Among other sustainable programs, beer distributors are utilizing alternative energy sources by undertaking initiatives that range from energy-saving lighting technologies to fuel-saving hybrid or biodiesel beer trucks. America's Beer Distributors: Delivering Sustainable Solutions Today to Protect Tomorrow's Environment is an educational brochure on beer distributor sustainability efforts and green initiatives. To request more information about these membership resources or copies of responsibility brochures, please contact NBWA at info@nbwa.org or 800-300-6417.